Because of this, it took 14 years for another entry in the franchise to hit screens. 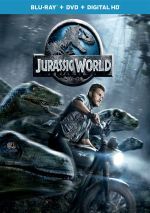 When it did, 2015’s Jurassic World reminded folks how potent the series could be – and its $651 million US ensured fans won’t need to wait very long for another dino adventure. 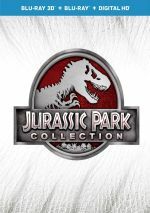 Since the last movie, corporate CEO Simon Masrani (Irrfan Khan) brought to life John Hammond’s dream: a theme park based around genetically engineered dinosaurs. Located near Costa Rica, “Jurassic World” becomes a global tourist magnet. I didn’t pen my thoughts about World when I first checked it out in June 2015, and I’m glad I didn’t, because I did alter my view of it. While I didn’t much care for it after that initial screening, subsequent revisiting has allowed me to better see its positives. Actually, the Blu-ray represents my third viewing of World, as I saw it a second time on the big screen. Why’d I pay to rewatch a movie I didn’t much like? Because I had enough affection for the franchise to give the movie another chance. Oh, and it was a $5 matinee on rainy day at a multiplex with no other flicks I wanted to see. Before I go into the reappraisal, I’ll discuss my original thoughts. On first viewing, I considered World to be all sizzle, no steak, mostly because the characters were so forgettable and dull. At least the first two sequels brought back participants from the original - characters we knew and found interesting. Lost World offered Jeff Goldblum and Park III involved Sam Neill, but the best World can do is BD Frickin' Wong! If the adults became more compelling, maybe I wouldn't mind, but they were duds as well. I like Pratt and Howard but they got parts with no substance at all and felt like they existed as characters just because the movie needed some "good" adults involved. Vincent D'Onofrio also felt like he was there as Token Bad Guy. I can’t explain what changed when I saw World a second time, but my opinion did alter, mainly in terms of basic enjoyment. Whereas I found myself somewhat bored with the movie initially, subsequent screenings allowed me to better appreciate the action. I suspect some of my disenchantment in June came from the nature of the action scenes, perhaps because it takes a while for the flick to really kick into gear. I think the first half establishes circumstances and characters fairly well, but it dollops out the dino doings a little too slowly. The initial act still works, but it can be a bit slow. Despite my reappraisal, some parts of my original criticism remain intact. On second – and third – screenings, I still don’t care much about the kids, and the other humans continue to seem fairly generic and forgettable. And yeah, I’m still disappointed World didn’t bring back any of the major actors from the original film. No offense to Wong, but he’s not a substitute for the first flick’s leads. All of these factors leave Jurassic World as an imperfect film, and I hesitate to say that I like it more than any of its predecessors. Though also flawed, I still might enjoy Lost World and Jurassic Park III more than World. Jurassic World appears in an aspect ratio of approximately 2.00:1 on this Blu-ray Disc. I expected a terrific transfer from World and I got it. Sharpness always excelled. From start to finish, the movie offered stellar definition, with awesome clarity and accuracy. I saw no shimmering or jaggies, and the image also lacked edge haloes. Of course, print flaws remained absent. When you bought your fancy-pants home theater, you did so for material like the dynamic DTS-HD MA 7.1 soundtrack of Jurassic World. Throughout the film, the mix offered audio elements that appreared well-placed and balanced. Music showed good stereo presence, and quieter moments exhibited a fine sense of place and atmosphere. Audio quality seemed top-notch. Effects became the most substantial element, and they appeared accurate and full, with vivid low-end response. Music was peppy and rich, and speech came across as natural and accurate. Heck, I even heard some lines I missed during my two theatrical screenings! The movie’s soundtrack added a lot to the movie and totally satisfied. 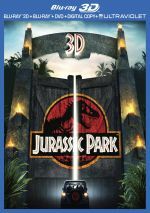 This package includes both 2D and 3D versions of Jurassic World. The picture quality comments above address the 2D edition, but I also want to talk about the 3D image. In terms of picture quality, the 3D World held up well. Like most 3D Blu-rays, it occasionally seemed a tad softer than the 2D edition, and it could be darker. Those weren’t substantial concerns, though, so the movie usually produced very nice visuals. As for the 3D imagery, it came across as a bit erratic, especially during the movie’s first half. A character looked at a Viewmaster early in the film, and that seemed ironic, as the 3D movie presentation occasionally gave off the exaggerated feel typical of the Viewmaster. I thought this mainly affected more static shots, though, and the 3D presentation picked up during action scenes. The sequence in which the I-Rex attacks the kids in the gyrosphere dazzled, especially in the way we saw the assault from the human POV. Flying creatures added real pep to the 3D imagery, too, and a bunch of other dino-oriented moments became impressive. World wasn’t the smoothest/strongest 3D Blu-ray I’ve seen, but it brought enough dimensionality to the table to be worth the effort. Seven Deleted Scenes fill a total of six minutes, eight seconds. Most of these offer short character moments, except for the one that provides a long character moment. The latter comes from a goofy sequence in which Owen and Claire smear dino dung on themselves to cover their scene. Beyond its callback to the giant dino crap scene from the original movie, it’s too silly to succeed. The other moments have some merit but don’t add to the story. Note that although both the deleted scenes and “Chris and Colin” also appear on the 3D disc, they remain 2D there. 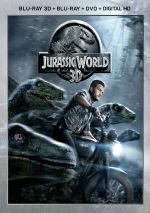 During the 29-minute, 52-second Welcome to Jurassic World, we hear from Trevorrow, Pratt, executive producer Steven Spielberg, co-writer Derek Connolly, producers Frank Marshall and Patrick Crowley, production designer Edward Verreaux, stunt coordinator Chris O’Hara, puppeteer John Robert Rosengrant, costume designer Daniel Orlandi, and actors BD Wong, Jake Johnson, Bryce Dallas Howard, Ty Simpkins, Nick Robinson, Omar Sy, Irrfan Khan, Vincent D’Onofrio, and Lauren Lapkus. We learn how Trevorrow came to the project, story/characters, cast and performances, sets and locations, stunts and action, and animatronics. “Welcome” can be a little more general than I’d like, but it touches on good topics and does so well enough to succeed. Dinosaurs Roam Once Again lasts 16 minutes, 29 seconds and features Pratt, Trevorrow, Spielberg, Simpkins, Howard, D’Onofrio, Marshall, Crowley, ILM senior VFX supervisor Dennis Muren, ILM data wrangler Chris Moore, visual effects supervisor Tim Alexander, visual effects animation supervisor Glen McIntosh, director of photography John Schwartzman, dinosaur consultant Phil Tippett, digital creature model supervisor Geoff Campbell, and actor Katie McGrath. Here we learn about the visual effects used in the movie as well as creature design. “Roam” offers a nice overview of those areas. In Jurassic World: All Access Pass, we get a 10-minute, 11-second piece with Pratt and Trevorrow. They discuss characters/performances, the gyrosphere, the motorcycle and military scenes, and the movie’s climax. “Pass” feels like it was intended to be part of a picture-in-picture pop-up feature. It offers some fun info but it seems oddly disjointed and scattered. A third disc provides a DVD copy of World. It offers the deleted scenes as well as the Chris and Colin and Roam featurettes but lacks the other extras. 14 years after the last film in the series, Jurassic World proves there’s still life in those dinosaur bones. While not the best of the franchise, World overcomes some flaws and mostly brings us vibrant, lively action-adventure. The Blu-ray delivers excellent picture and audio as well as a decent set of supplements. Jurassic World entertains.